Sermon delivered on January 8, 2012 by Fr. 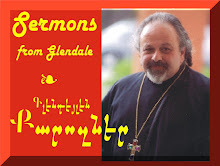 Vazken Movsesian at the Armenian Church Youth Ministries Center in Glendale, California. Making the Nativity story relevant - Fr. Vazken explains how Armenians have ended up in a Diaspora created because of a Herod-like enemy. And as Joseph and Mary were called back from Egypt, the time has come for Armenians to return to their spiritual roots. Sermon begins with with a reading by Rita Papazian and leads to Fr. Vazken's defense of the Armenian Church.